This particular example, The Soviet T.34 tank 40082, was printed by Revell, presumably after 1990. 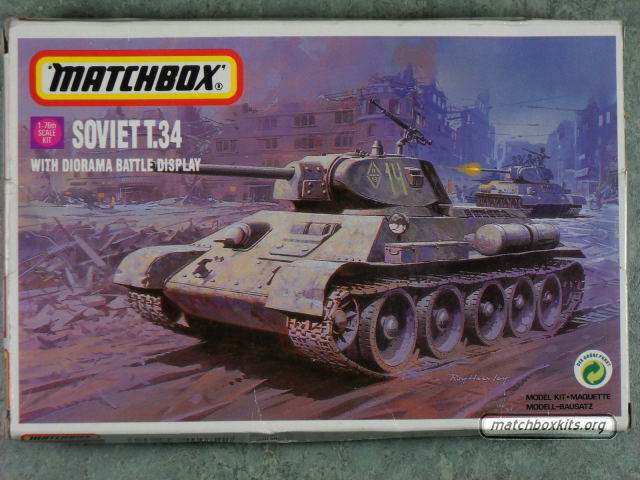 The latest change of the T.34 box was by Matchbox International in 1988. Revell printed this box with exactly the same boxart, logo and copyright year in the nineties. A small giveaway is the green dot with the text "Der Gr�ner Punkt", the license symbol of Die Duales System Deutschland GmbH that exists since 1990. It appears on kits that have been printed by Revell Germany from 1990 onwards.